Preferred RSVP is by March 22 to be sure that we will meet the minimum attendance requirement. Deadline to RSVP is April 8 to notify the caterer of the final meal count. If you RSVP “yes,” then later find out that you can’t attend, please email to cancel no later than April 7. Cancellations on or after April 8 or meeting no-show’s will be required to mail a check for the meal that was prepared for you. Thank you! Time: Check-in starts at 10:30 a.m.; Adjourn at 2:30 p.m. Menu: The meal will be boxed lunches. Please select your preferred box lunch from the list on the RSVP form. Anyone who fails to select a preferred box lunch will be provided a Smoked Chicken Panini lunch. 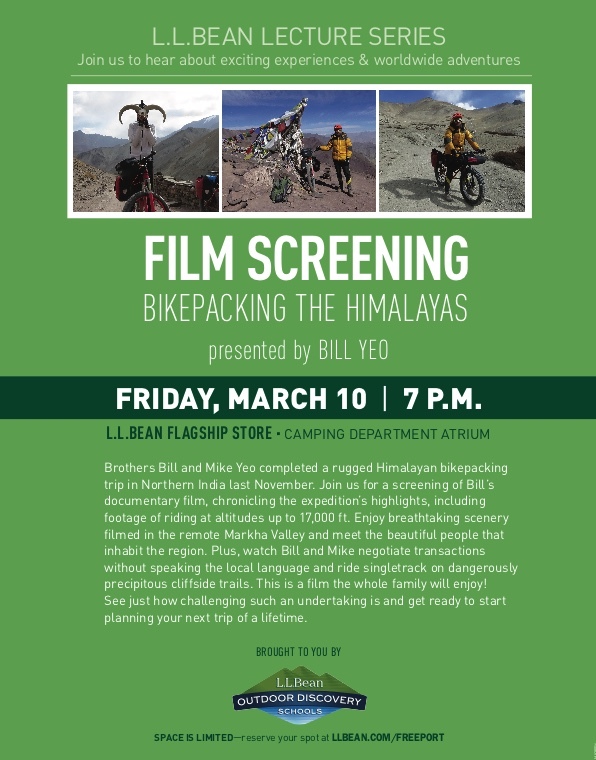 We will have a SPECIAL PRESENTER at this meeting — Bill Yeo, who will screen a documentary and tell his story of Bikepacking the Himalayas, from the L.L.Bean Lecture Series. See below for a flyer describing a previous screening of Bill’s story (disregard the date and location on this previous flyer). He will customize his presentation especially for this TCC audience. For program description only; disregard the date and other information on this previous flyer.